(Nanowerk News) An international team of astronomers has been able to see into the heart of an exploding star, by combining data from telescopes that are hundreds or even thousands of kilometres apart. Their results are published in the journal Nature ("Binary orbits as the driver of gamma-ray emission and mass ejection in classical novae"). Highly-detailed images produced using radio telescopes from across Europe and America have pinpointed the locations where a stellar explosion (called a nova), emitted gamma rays (extremely high energy radiation). The discovery revealed how the gamma-ray emissions are produced, something which mystified astronomers when they were first observed in 2012. 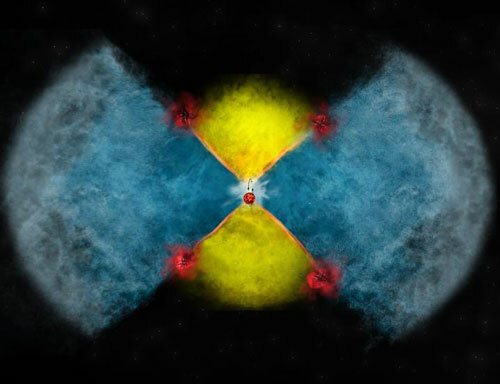 "We not only found where the gamma rays came from, but also got a look at a previously-unseen scenario that may be common in other nova explosions," said Laura Chomiuk, of Michigan State University. Tim O'Brien of The University of Manchester's Jodrell Bank Observatory, one of the international team of astronomers who worked on the study, explains, "A nova occurs when gas from a companion star falls onto the surface of a white dwarf star in a binary system. This triggers a thermonuclear explosion on the surface of the star which blasts the gas into space at speeds of millions of miles per hour". "When it explodes it brightens hugely, leading in some cases to the appearance of a new star in the sky, hence the term nova. These explosions are unpredictable, so when one goes off, the pressure is on for us to try and get as many of the world's telescopes as possible to take a look before it fades away. For this nova, our international team was primed and ready to go and we really came up trumps." Astronomers did not expect this nova scenario to produce high-energy gamma rays. However, in June of 2012, NASA's Fermi spacecraft detected gamma rays coming from a nova called V959 Mon, some 6500 light-years from Earth. At the same time, observations with the Karl G. Jansky Very Large Array (VLA) of telescopes in the USA indicated that radio waves coming from the nova were probably the result of subatomic particles moving at nearly the speed of light interacting with magnetic fields. The high-energy gamma-ray emission, the astronomers noted, also required such fast-moving particles. Later observations from the telescopes of the European VLBI network (EVN) and the Very Long Baseline Array (VLBA) in the USA revealed two distinct knots of radio emission. These knots then were seen to move away from each other. This observation, along with studies made with the e-MERLIN telescope array in the UK, and further VLA observations in 2014, provided the scientists with information that allowed them to put together a picture of how the radio knots, and the gamma rays, were produced. In the first stage of this scenario, the white dwarf and its companion give up some of their orbital energy to boost some of the explosion material, making the ejected material move outward faster in the plane of their orbit. Later, the white dwarf blows off a faster wind of particles moving mostly outward along the poles of the orbital plane. When the faster-moving polar flow hits the slower-moving material, the shock accelerates particles to the speeds needed to produce the gamma rays, and the knots of radio emission. "By watching this system over time and seeing how the pattern of radio emission changed, then tracing the movements of the knots, we saw the exact behaviour expected from this scenario," Chomiuk said. A technique called radio interferometry, in which data from various radio telescopes are combined to obtain a sharper image, played a fundamental role in this result. By connecting together radio telescopes across tens, hundreds and even thousands of kilometres, the scientists were able to zoom in to get a much sharper view of the heart of this exploding star. Gamma rays from several nova explosions have now been detected so it may be that the phenomenon is relatively common, but perhaps seen only when the nova is sufficiently close to Earth. Because this type of ejection is also seen in other binary-star (two stars orbiting each other) systems, the new insights may help astronomers understand how those systems develop. The phase in which matter ejected from one star engulfs its companion occurs in all close binary stars, and is poorly understood. "We may be able to use novae as a 'testbed' for improving our understanding of this critical stage of binary evolution," Chomiuk said.